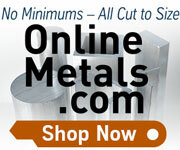 We make it easy to pay for your LittleMachineShop.com orders! We accept credit cards, debit cards, checks, money orders, wire transfers, and PayPal payments. We also facilitate payment through the Affirm lending company and equipment leasing companies. We accept MasterCard, Visa, American Express, and Discover payments directly through our secure Web site. Simply enter your credit or debit card details in the form. You can pay us securely from your PayPal account, your checking account, or with any major credit or debit card using PayPal. PayPal also offers financing with PayPal Credit. We accept personal checks, company checks, and money orders. Complete your order on our Web site, and choose Check as the payment method. You will get instructions on where to send the payment and we will hold your order until we receive it. We have arrangements with several leasing companies that will help you finance your larger machinery purchases. You can contact them regarding leasing options. If your order totals more than $1,000.00, you can pay by wire transfer. Complete your order on our Web site and choose Wire Transfer as the payment method. You will see the information you need to initiate the wire transfer and we will hold your order until we receive payment. Wire transfers are too expensive (for you and for us) to use for smaller transactions.